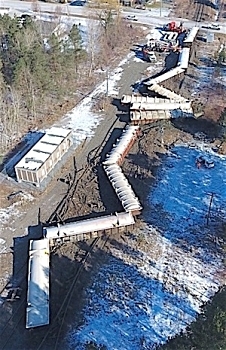 the extra kinetic energy of the railcars causes them to scatter in a serpentine pattern behind the engine (see photo). When a river has more energy than it can dissipate through turbulence and sediment transport, it will carve meanders in its floodplain to reduce its gradient and stream power. 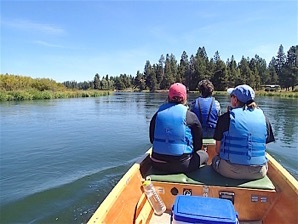 A classic example of this river dynamic is found in a 6-mile meander belt on the Upper Deschutes River, between LaPine State Park and the Big River Campground. What Causes a River to Meander? The most common factor is flat, low-gradient terrain. When a flowing river reaches relatively flat terrain, it slows up because the ground slope cannot sustain the velocity that the stream had in steeper topography. The excess kinetic energy of this flowing water then causes the stream to begin cutting into its banks and moving laterally across the floodplain. This same dynamic occurs when, as in a train wreck, a river encounters an immovable barrier or rock sill across its floodplain. Because it cannot erode this rock sill quickly, the river slows and begins to dissipate its excess energy by meandering. A large basalt rock sill across the Upper Deschutes River at River Mile 201.6, at the foot of the meander belt, appears to be the primary cause of this river’s meandering behavior for 5-6 river miles upstream. As any river begins to bend, the water on the outside edge of the curve flows faster and has more energy than the slower-moving water on the inside of the bend. Thus the stream erodes its outer banks and deposits silt on its inner banks as it moves laterally across its floodplain (see photo of Upper Deschutes above). When a meander gets cut off from the main stream, an oxbow lake forms. Over time, by this constant, gradual process of erosion and deposition, river meanders also slowly migrate downstream. How Fast Do Meanders Migrate? Though gravity exerts a constant, uniform tug drawing flowing water downhill, there are so many other factors involved in erosion rates that it is hard to generalize. Some streams have steeper gradients and more energy, some floodplain soils erode more easily than others, and all streams erode more quickly during floods and other peak runoff events. 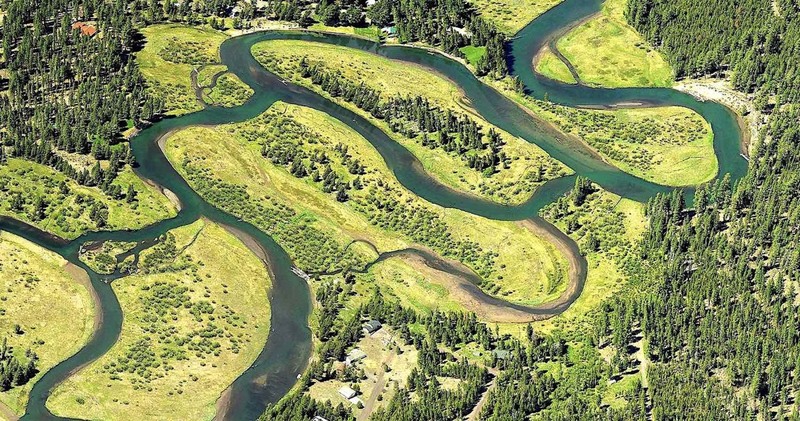 However, in the case of the Upper Deschutes meander belt, we have historical aerial photography (courtesy of Google Earth) that allows us to make a rough estimate of how fast these meanders are moving. In LaPine State Park at River Mile 205.2, the center of an old collapsed log cabin was 35’ from the river bank in a 1994 aerial photo (at left above). Today in 2017, the river bank has reached the center of the cabin and only half of this structure is still on dry land. Thus this meander has moved 1.5 feet per year (35 feet/23 years). and how fast one wants to paddle, this summer float trip can take anywhere from 2 to 5 hours. This river segment is all Class I, flat water with no rapids, but one needs to keep an eye out for the occasional submerged snag — plus wear a PFD (personal float device or life jacket). The branching watercourses within the meander belt form a 250-acre zone of prime wildlife habitat, supporting otters, mink, beavers, raccoons, as well coyotes, mule deer and elk. Common bird sightings include Canada geese, mergansers and various ducks, plus great blue herons, osprey and bald eagles. Be sure to pack your binoculars! A second way to visit the meander belt is to hike into it on the Fall River Trail within LaPine State Park. This 2.4-mile roundtrip hike starts at the trailhead on the south side of Fall River on Forest Road 4360, off South Century Drive (see map download). The trail is well-marked and generally follows the south bank of Fall River, either next to the stream or in the forest parallel to it. At 0.8 miles, the trail leaves the river, heads south, and soon comes to a power line road. Walk the power line south for 80 yards to a signed trail branching left (east). Follow this trail (soon a double-track road) southeast for another 0.3 miles to where one first glimpses the Big Deschutes River on the east. Look for a short side trail branching left down to the river, at a “No Camping Permitted” sign. Once at the bank of the Big Deschutes, one can explore the meander belt up and downstream, all on State Park lands. About 250 yards downstream, look for the old log cabin currently being undercut by the migrating river meanders (photo above). DISCLAIMER: Every effort has been made to ensure the accuracy of this information, but the authors do not guarantee that it is either current or correct. The reader assumes full responsibility for any use of this information, and is encouraged to exercise all due caution while recreating. Interested in less-known and often overlooked adventures, all within a day's trip from Bend? This website highlights noteworthy features of geographic and historical interest on public lands in Central Oregon. Each blog post includes site descriptions and photos, plus travel and hiking maps for the inquisitive explorer.